A good shooter and a natural salesman. After a stint as a semi-pro in Akron, Chuck Taylor moved on to the Converse Rubber Shoe Company’s Chicago sales office. There he would have an impact on the game far more profound than any he had enjoyed as a player. In 1923 [actually 1932] Converse put his name on the ankle patch of a shoe he’d helped to restyle, a high-top, black-and-white, vulcanized-rubber-and-canvas basketball shoe: the Converse Chuck Taylor All Star. For decades, Taylor drove trunk-loads of them around the United States, selling coaches and athletes on the twin blessings of All Stars and the sport of basketball. Taylor’s down-to-earth ambassadorship had won the man and his shoe such respect that Converse commanded nearly 90 percent of the basketball-shoe business by the late 1960s. Black-and-white All Stars were still tumbling off Converse’s Lumberton, North Carolina, assembly line when Converse created the “Stars & Bars” sneaker for the shoe’s 75th birthday in 1992 and donated a pair to the Smithsonian’s National Museum of American History. If the commemorative edition was as flamboyant as Old Glory flapping in a gale-force wind, Converse could be forgiven. By century’s end, All Stars had found their way onto more than a billion feet. They had become an American artifact nearly as recognizable as another Smithsonian all-starFrancis Scott Key’s Star-Spangled Banner. While Chuck Taylor All Stars never had to face British cannon, by the start of the new millennium they had stood up to an onslaught nearly as witheringa changed athletic-shoe business dominated by high-performance technology, relentless marketing and cheap overseas labor. All Stars still sported the eight aluminum porthole eyelets running up each side, a bulbous rubber toe, the ankle patch that bore Chuck Taylor’s signature and, at the heel, a tag that proclaimed that this All Star was “Made in U.S.A.” But the American All Star would barely outlast the 20th century. 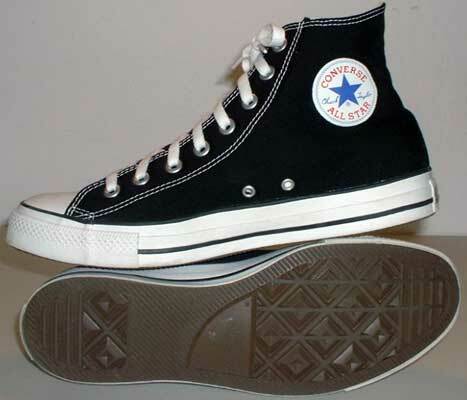 On March 31, 2001, the Lumberton assembly line spat out its last pair of Chuck Taylor high-tops. Some weeks later, a consortium led by sports-industry entrepreneurs William Simon and Marsden Cason purchased all rights to the Converse brand name. Today, joining the likes of Keds and Nike, Chuck Taylor All Stars are made in Asia. In retrospect, Chuck Taylor’s death in 1969 had signaled the beginning of the decline of the shoe that bore his name. At the 1968 Summer Olympics in Mexico City, Adidas dominated track and field with its triple stripes, padded leather uppers, and soles fused not by vulcanization but by more durable cold-set glue. Adidas and Puma would dominate the ’70s; Reebok and Nike the ’80s. Unlike Converse, many of the new sneaker companies were not manufacturers; Nike, for example, has never produced a single shoe in a plant of its own, instead subcontracting the work to factories scattered around the world. With this manufacturing flexibility, the newcomers introduced ever-escalating technology and sticker prices, myriad design experiments, and leather, suede and nylon to vie with plain old canvas and rubber. As Converse scrambled to make leather sneakers and to open its own biomechanics lab, the All Star, whose pivoting abilities, ankle support and nonskid sole had been championed for a half century, was repositioned as a shoe for nonathletes. It was no longer the choice of NBA and college power forwards but of the Rolling Stones on their 1989 “Steel Wheels” concert tour and of high school hipsters turned off by the slick marketing of Nike and Reebok. Simon pledges that as he reorients the company toward high-performance, technology-laden athletic footwear, the All Star will remain. “We are going to build the casual footwear side around the Chuck Taylor," he says. Stay tuned. Originally published in the November 2001 issue of Smithsonian. Copyright 2001. Smithsonian Institution. All rights reserved.